Turkey meatloaf is easy to prepare, lean and healthy. It provides protein as well as vitamin B6, selenium and niacin, without the fat of red meat. There are a variety of ways to prepare ground turkey, besides meatloaf, so you will find it easy to add to your diet. Fat-free ground turkey has 112 calories and 24 g of protein per 100 g, or about 3.5 oz., while 85 percent lean ground turkey has 180 calories, 17 g of protein and 12.5 g of fat. Lean ground turkey, with 7 percent fat, has 150 calories per 100 g, 19 g of protein and 8 g of fat. 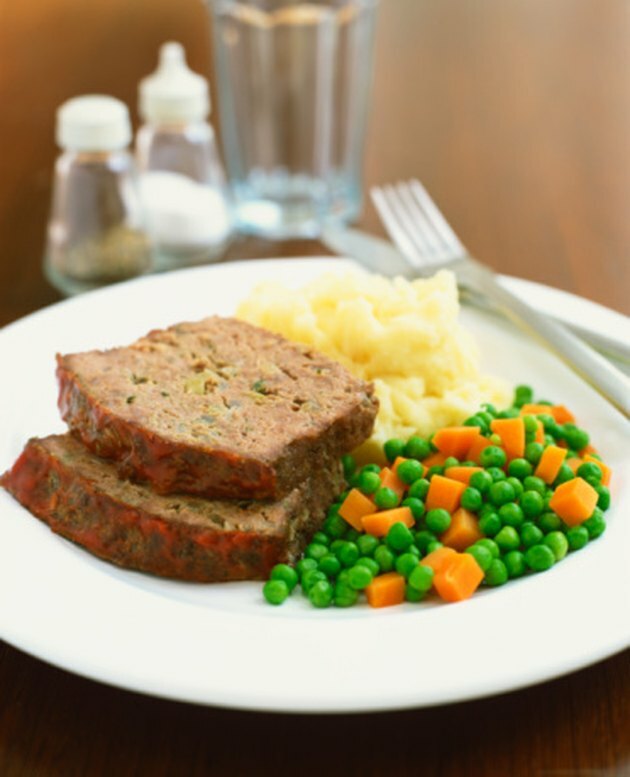 A typical meatloaf recipe, made with lean ground turkey, calls for 3 cups of onions, 2 tbsp. of oil, 1/3 cup of Worcestershire sauce, 3/4 cup of chicken stock, 1.5 tsp. of tomato paste, 5 lbs. of ground turkey breast, 1.5 cups of bread crumbs, three eggs and 3/4 cup of ketchup. The recipe makes 15 servings, about 3 oz. per serving, and each serving has 360 calories, 17 g of fat, 594 mg of sodium and 33 g of protein. Lean ground turkey can be dry, so recipes for turkey meatloaf or turkey burgers often call for broth, eggs, tomato sauce or other liquids as well as bread crumbs to keep the meat moist. To keep the calorie count as low as possible, avoid using oils or eggs.